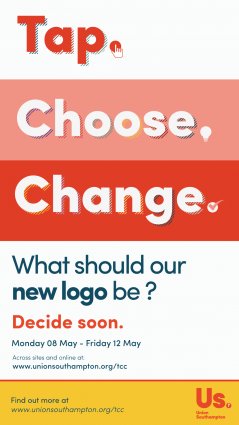 It’s simple; all you have to do is select your preferred logo out of three different designs. You can do this using your Student ID in person at one of our stations across campus, or online at www.unionsouthampton.org/tcc. The most popular design will become our new logo and will represent our Union as we begin the implementation from June this year. It is time for you to have your say and we can’t wait to see what you choose!